You guys are amazing. Thank you for all the congratulations and spreading news about the book, here on the blog, on Facebook, Twitter, and in person. At the risk of coming off cheesy, it's really incredibly heart-warming to have such great support from the readers of Appetite for China, some of whom have been reading since the very beginning. Thank you, thank you, thank you. 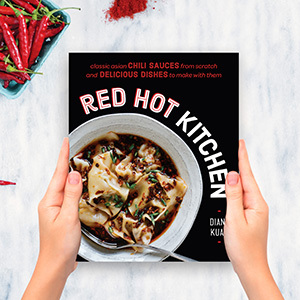 It's been one month since The Chinese Takeout Cookbook was released and seeing all the good press surrounding the book has been so surreal and wonderful. There was a recipe review in The Washington Post, radio segments on Let's Eat In on Heritage Radio Network and The Joan Hamburg Show, a full-page feature in The New York Daily News, not to mention round-ups and reviews in other local press. An unexpectedly large headshot. But so great to be featured in a paper with such wide circulation! As for events, last night I took part in a cooking demo and book signing at the wonderful BookCourt in Brooklyn. (More pics up to come!) There are other events coming up, including a Chinese Takeout Cookbook Class at the Institute of Culinary Education this coming Sunday, Jan 20th, in which we recreate 8 recipes from the book, including favorites such as egg rolls, sweet and sour pork, and egg drop soup. And I'm planning more events for NY and other cities soon, so stay tuned! And if you've had a chance to enjoy the book so far, it would be so wonderful if you could take a minute to post a review on Amazon to let others know about your experience! Even a short 1 or 2-sentence review would be a great help! Thank you all so much again for cheering this book on!